After ten long years of war and the fall of Troy, the Greek hero Odysseus sets sail for his homeland. His voyage, however, is destined to take much longer than he expects. During his eventful journey Odysseus comes across all sorts of monsters and mythical creatures, and loses his ships and crew. When he finally reaches his beloved island he finds his queen besieged by suitors who claim his throne. What tricks will Penelope resort to in her effort to avoid them? And how does Odysseus get rid of the impudent suitors and regain his wife and kingdom? 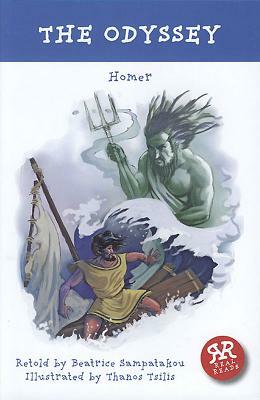 The amazing adventures of the legendary hero come alive in this masterful retelling of Odysseus's epic voyage. Real Reads are accessible texts designed to support the literacy development of primary and lower secondary age children while introducing them to the riches of our international literary heritage. Each book is a retelling of a work of great literature from one of the world's greatest cultures, fitted into a 64-page book, making classic stories, dramas and histories available to intelligent young readers as a bridge to the full texts, to language students wanting access to other cultures, and to adult readers who are unlikely ever to read the original versions.